Get A Sweet Treat with "No Funky Stuff" from @otis_spunkmeyer! It's no secret that we like a sweet treat in our house! But what we don't like is "funky stuff" that are often found in sweets including high fructose corn syrup, artificial colors and flavors and partially hydrogenated oils. So these days when I need something sweet after a long day, with my coffee on the weekend or with a nice tall glass of wine, I reach for Otis Spunkmeyer! Otis Spunkmeyer promises me ‘No Funky Stuff’ and promises that their all-new retail line of 20+ cookies and sweet treats is made without artificial flavors or colors, high-fructose corn syrup or partially hydrogenated oils. It’s the perfect snack for back-to-school (or for parents!) that everyone can feel good about. Otis Spunkmeyer was one of the original sweet treat brands, with their famous cookies launching in the 70’s. 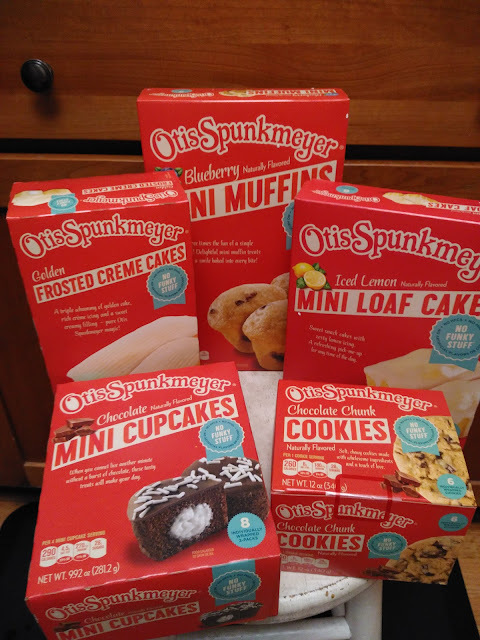 Their new commitment to using better-for-you ingredients – or ‘No Funky Stuff’ – means that Otis Spunkmeyer’s cookies, frozen cookie dough, and new snack cakes, cupcakes and muffins are all delivering on a superior tasting treat that kids and parents love! There wasn't a single treats from Otis Spunkmeyer that I didn't like - from their cookies to the Mini Loaf Cakes to the Mini Cupcakes! Each was a treat and I loved that each was individually wrapped so I could hold back with just eating one (well...most of the time!) :) Plus, that makes it great for grabbing on-the-go for all the busy, summertime fun you are having! These individual sized, "No Funky Stuff" treats are great in lunches as a special treat this upcoming school year (would make a great 1st day of school treat!) or in the picnic basket this summer! No matter where you eat them or what you are doing, I can vouch that they are DELICIOUS and made without the icky ingredients! I LOVE THAT! You can purchase Otis Spunkmeyer snacks at a local retailer.